From Tricker´s famous country collection, these marron coloured brogueShoes with a pattern of holes on the outer leather. Associated with less formal dress shoes and with country shoes. boots are ready for all season use with a Dainite rubber sole. Storm welted and with a bellow tounge to keep you dry. The last is comfortable with a single sock. Marron Antique Calf leather. 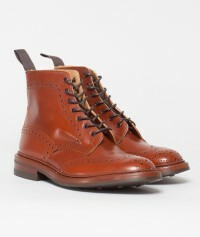 Full brogue Derby boot. Dainite rubber sole. Goodyear welted with storm welt. Bellow tounge. Last 4497S. Width 5.